Tim O'Reily looks through the other side of the prism of connectivity and commoditization in The Open Source Paradigm Shift. I characterized it as a challenge to the end-user public, to roll our own commodity networks. Tim speaks to businesspeople, enouraging them to find markets at the edges while contributing to the "Internet operating system" in the middle. The way to get there isn't necessarily for all businesses to become commodity businesses, but for businesses to ensure that the commodities they need are produced in sufficient quantities for all. Even if the end-user benefits from this commoditization are "mere" externalities, they're benefits all the same. 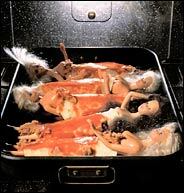 In December, I noted artist Tom Forsythe's legal victory, when the 9th Circuit held that "Food Chain Barbie" was fair use. Now, the district court has fortified that ruling with a substantial award of attorneys' fees, $1.8 million, the New York Times reports. As Berkman colleague Jonathan Zittrain notes in the Times, this ruling helps avert the chilling effect of legal threats, if it causes executives and their counsel to think twice before sending groundless and unreasonable complaints. Just have to make sure that's clear, now that Orrin Hatch has introduced the threatened INDUCE Act (PDF) (already renamed IICA). The bill would create a new class of indirect liability for anyone who "intentionally aids, abets, induces, or procures" copyright infringement. With that broad definition, no developer, vendor, or funder of emerging technologies is safe. Save the iPod might sound extreme, but EFF was able to draft a colorable complaint against Apple -- one that would cost a lot in legal fees to defeat even if Apple might win in the end. This isn't about P2P, it's about letting Hollywood drop a lead weight on the copyright balance between author and public. It's saying no one may develop disruptive technologies without permission. It's saying the public rights are frozen in 2004, because no one will risk developing the tools the public needs to keep pace with publishing technology. Please help us stop INDUCE in its tracks. Kevin has given Supernova attendees two keywords for the conference, "decentralization" and "commodification." Decentralization empowers the users at the edges of networks, whether it's physical networks or communications networks. These users (the public) need networks to connect them, but they're best served by a commodity network (as James Seng noted, the best network is the one that does the least). Some of the most fun discussions are those about user-driven innovation, the "misuse" of technology to do things its producer didn't expect. Dodgeball takes cellphones and turns them into location-sensors that the user, not the phone company, controls. Imagine that application on fully programmable mobiles, rather than hacked from SMS. Likewise, voice-over-IP can be far more than a glorified cheaper telephone call, but only if the users are allowed to manipulate their own data (or purchase from a variety of providers offering to do it for them. The problem is that no one wakes up and says "I want to be in a commodity business." Commodity production doesn't give monopoly margins. Most CEOs would rather risk everything shooting for a unique market. How do we convince them to provide the basic, dumb-network service, or how do we roll out the infrastructure for ourselves? Sadly, piPod, a New York pizzeria guide for your iPod doesn't reach San Francisco. Even sadder, neither does New York pizza. Via Gizmodo. Good decision today in CoStar v. LoopNet. The 4th Circuit affirms that even in the age of DMCA, liability for direct copyright infringement requires "volitional conduct" and "meaningful causation" by the alleged infringer. LoopNet allowed subscribers to post real estate photographs on its website. CoStar claimed that some of these photographs infringed its copyrights, and sued LoopNet as the direct infringer. The court held that even though LoopNet reviewed the images before posting them, the ISP was not the one actually engaged in the infringing reproduction. The ISP in this case is an analogue to the owner of a traditional copying machine whose customers pay a fixed amount per copy and operate the machine themselves to make copies. When a customer duplicates an infringing work, the owner of the copy machine is not considered a direct infringer. Similarly, an ISP who owns an electronic facility that responds automatically to users’ input is not a direct infringer. If the Copyright Act does not hold the owner of the copying machine liable as a direct infringer when its customer copies infringing material without knowledge of the owner, the ISP should not be found liable as a direct infringer when its facility is used by a subscriber to violate a copyright without intervening conduct of the ISP. Direct copyright infringement is still a strict liability offense, but it's good to be reminded that you have to do something to trigger that liability. LawMeme points to another part of the lawmaking process changed by technology Computer-Generated Redistricting. Basically, Maptitude takes the guesswork out of redistricting. A political party in charge of the state legislature can now, with a remarkable degree of precision ("within a single voter," one panelist said), redraw voting districts so that the districts include any set of voters that the political party wants. This historically unprecedented power is only enhanced by the latitude that states have been given to draw district lines. State legislatures have always been able to design districts with bizarre shapes to further particular results, technology just gives them greater precision. My EFF colleague Cory warned Microsoft Research against DRM. True to his recommendations that access is better than lockdown, he's put the entire text of his talk into the public domain. Whether you like Microsoft or not, you've got to recognize that they haven't gotten to be the richest company in the world through stupidity. DRM is long-term stupid. It's technology designed to make technological products less useful ("Where do you want to frustrate your customers from doing today? "), and it doesn't work as long as there's one determined attacker in the audience. The DRM moment has been left behind by science. Publishers were looking for pay-per-use and perfect price discrimination; DRM promised it to them. But DRM was backed by bad science. As long as we live in a world where we can still talk to our friends and still tinker with our tools, DRM is doomed to failure. And when it fails at its primary purpose, it succeeds only at driving potential customers to other sources. In the short term, DRM may help facilitate lock-in to a particular manufacturer's products. Once you buy a few Microsoft media player tracks, it's easier to keep buying Microsoft. But as the format gets less useful, and the media player's requirements become more restrictive, OGG looks more attractive. Sure, it'll take some effort to get your existing tracks back (you might have to convert, re-purchase, or find clear versions on the Darket), but once you see the gains in flexibility, you're unlikely to look back. Customers jump ship from DRM, with best customers first over the edge. If Microsoft as technology company doesn't see that, it's just ceding its leadership to someone who does. "Dozomo is a quick way to reach every search engine in the world! " It's also an art project/hack at the Wizards of OS conference, doing a 24-hour DotCom. Watch for the eBay IPO. I think. UPDATE: Thanks to tor, which installs and runs quickly even on the Mac, I now have a secure, anonymous Net connection and can get Google back again, even on the WOS net. Creative Commons Germany launches with a bang, announcing not only German licenses, but lots of newly unrestricted material. Janko Roettgers announced the relicensing of his book, Mix, Burn & R.I.P. by a major German publisher; the team of CH7 showed their CC-licensed film, which has been downloaded more than 70,000 times already. If copyright in the U.S. creates entangling defaults, international copyright adds even more layers of potential incompatibility. Continental European countries recognize moral rights (droit moral); each country specifies the author's exclusive rights and options in its own terms. To be understood by lawyers, the licenses need to speak in these terms of art; to be understood by artists and facilitate international collaborations, the licenses must convey similar meaning in each national instance. The iCommons licenses translate the CC "some rights reserved" concept to help creators through the cross-border copyright muddle. Personally, I'm looking forward to the cc-enabled translation of Janko's book, since it's beyond my rudimentary German! If you think the work of the ordinary archivist is hard, pity the computer game archivists. They have to contend with obsolesence of proprietary hardware, emulation of complex systems with minimal documentation, and copy controls (and the DMCA), not to mention the confused looks from those who don't understand why games matter. Well, the games that fill our leisure environment clearly matter as culture, but archaeologists of the future will have a difficult time understanding that part of our culture without archivists like those just speaking at Wizard of OS: Open Archives II. Games. If culture isn't enough, though, computer and video games have also been the subjects of some of the best recent U.S. copyright decisions: Sega v. Accolade and Sony v. Connectix, both affirming that reverse engineering (and copying in the process) for the purpose of interoperability are fair use, not copyright infringement. The Internet Archive's explanation of its work to preserve games and other software garnered one of the four DMCA exemptions granted by the Librarian of Congress in the Copyright Office's recent rulemaking. Thanks guys! I've been in Geneva for the past three days, where the World Intellectual Property Organization's Standing Committee on Copyright and Related Rights (SCCR 11) has been meeting to consider a treaty to protect broadcasters' rights. Thanks to Jamie Love, of the Consumer Project on Technology, an unprecedented number of public-interest oriented non-governmental organizations -- including CPTech, , UPD, IP Justice, Public Knowledge, and EDRi -- attended and intervened at the meeting to raise concerns about preserving the public's rights in the face of expanded "broadcast protection." We also spoke with many governmental delegations and other NGOs about our concerns that this treaty would mandate international adoption of technological protection measures like the U.S. broadcast flag. We also brought new transparency to the rather closed process of treaty preparation. To that end, we've posted notes taken collaboratively with SubEthaEdit (a great Mac collaboration app) -- Notes from the full Standing Committee meeting. - Brazil is concerned with proposed inclusion of TPMs in proposed new treaty. Aware that similar provisions are in WCT and WPPT, but it's important to recall that those treaties were negotiated and adopted when there was little awareness regarding potential implications of use of TPMs. Since then, some years have gone by, and there's a growing widespread awareness that use of such measures can be quite detrimental to rights of consumers and public at large. Significant concern that anticircumvention has significant negative for exercise of rights exceptions and limitations in national laws. Important obstacle to access of public to public domain material. Inconsistent with necessary free flow of info so important to encourage innovation and creativity in the digital environment. All of Art 16 [TPMs] counters stated objectives of new treaty as referred to in preamble. There, paragraph 4 recognizes the need to maintain balance between rights of broadcasters and larger public interest. US prepared its proposal to deal with important 21st century tech development, webcasting among them. Rome was a pioneering convention, before many states had adopted neighboring rights. Do the same here: protect broadcast, cablecast, webcast. Value added by deliverer of contents should be protected because it can be pirated regardless of its means of delivery. At the end of three grueling days, where most of the action took place in the hallways and lunchtime briefings, the Standing Committee recommended weakly that the General Assembly consider proposing a diplomatic convention at a later date -- far less than the treaty proponents wanted. I'm flattered to have been invited to speak at two exciting events: Supernova 2004, June 24-25 in Santa Clara, and BlogOn 2004 - The Business of Social Media, July 23 in Berkeley. I'll be talking about how intellectual property rights should be exercised -- versus the way they often are. This isn't a message just for activists and individuals, but one for businesses and corporations as well: You can court your customers or you can threaten to sue them. In the long run those who offer better value and better service will succeed over those who bully. Both conferences are going interactive. Lots of great places to read more and add your commentary: Supernova weblog and Supernova wiki; BlogOn weblog. Here, dedicated to the public domain, are our joint notes from Day 2 of WIPO Meetings on the Draft Broadcasting Treaty. After the governmental delegations concluded their intial rounds of comments, non-governmental organizations such as EFF were permitted three minute statements. EFF tried to raise concerns about forcing technological protection measures, like the DMCA-endorsed DRM, into yet another sphere. We believe that the technological measures in Articles 16 and 17 are not required for the protection of broadcasters' signals and thus should not be incorporated in the proposed Treaty. EFF is a co-signer to the NGO statement of principles on the proposed treaty and has submitted a Floor Statement to the Secretariat detailing its views, and will briefly outline its concerns here. Article 16 requires Member Countries to adopt extensive mandates over everyday technologies like televisions, and radios. It envisions broadcasters "marking" broadcasts, cable transmissions and webcasts with something like the American "broadcast flag". All signal-receiving devices -- even personal computers -- will be required to detect and respond to the flag. Tomorrow's the day when we see whether the broadcasting treaty proposal moves to the next step on the road to treaty-hood, a diplomatic conference, stays with the Standing Committee agenda for further development, or dies. Thanks to budget air carriers and countries still willing to allow Americans in, I've been on a bit of a European tour. I got to talk with a great crowd at Vienna for FREE BITFLOWS, had a fantastic time at NotCon , in London, and am now in Geneva for WIPO's Standing Committee on Copyright and Related Rights. Next stop, Berlin for Wizards of OS 3: The Future of the Digital Commons. New mobile devices based on a version of the Symbian OS are a serious threat to mobile operator revenue streams, according to consultancy Mako Analysis. Savvy users can use devices running on Symbian's Series 60 operating system (OS) to completely bypass a range of services that are normally charged for by their mobile operator, the UK-based consultancy warned on Monday. While the threat is currently minimal, the loophole has the potential to cause major headaches for operators. Open handsets let users choose their applications, which have to compete on pure value. Sure lock-in is nice for sellers -- until buyers bypass the locked-in route altogether. Companies who take the path Mako recommends are just clearing the way for others to listen to their (former) customers. Even those who can't put lost creativity on a balance sheet should be disturbed by this kind of consequence. After spotting several nuggets on her blog, I look forward to meeting Suw at NotCon 04.